“Good planning and hard work lead to prosperity, but hasty shortcuts lead to poverty”(Proverbs 21:5 NLT, second edition). If you want God to use you in great ways this year, you’ll need focus. The more focused you are in 2016, the more effective you’ll be — and the more God will use you. There’s awesome power in a focused life. Diffused light doesn’t have much of an effect on what it touches. But when you focus light — like the sun’s light through a magnifying glass — you can light a piece of paper or grass on fire. If you can focus it even more, it becomes a laser. A lasercan cut through steel and destroy cancer. The same is true with your life. If your 2016 is directionless, you’ll just drift through without impacting much. But if you focus your year on a few key goals, then you can make a powerful impact on the world for God. The Bible says, “Good planning and hard work lead to prosperity, but hasty shortcuts lead to poverty”(Proverbs 21:5 NLT, second edition). Like all good goals, Eliazar’s was clear. He knew he needed to find Isaac a wife, and he knew exactly what kind of wife to look for. He needed to find a wife from Abraham’s homeland. You’ll never reach a vague goal because you’ll never know if you’ve completed it. Eliazar didn’t have that problem. For example, if your goal for 2016 is to be a better parent, that’s vague. Even if you make the goal to spend more time with your children this year, you’ll never really know if you’ve completed the goal. So what specific goal will you set for yourself in 2016? How do specific goals empower you to complete them? With support from medical and fitness experts, Pastor Rick Warren and thousands of people from his congregation started on a journey to transform their own lives. 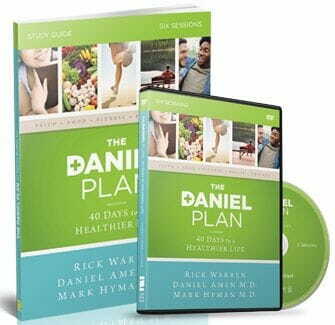 Its called The Daniel Plan and it works for on simple reason: God designed your body to be healthy and He provided everything you need to thrive and live an abundant life. Originally published April 20, 2016.